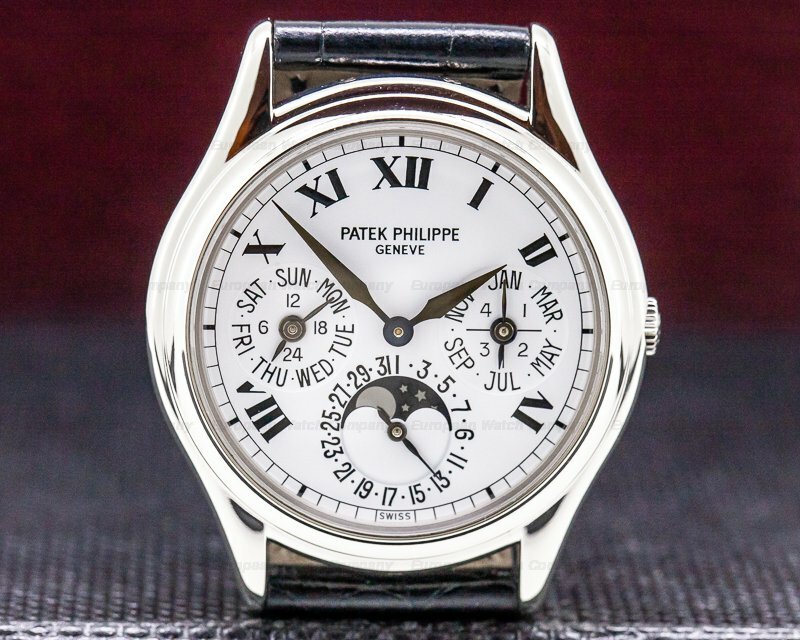 30117 Patek Philippe 5200 Gondolo 8 Day, 5200G, 5200G001, 5200G-001, this reference is officially discontinued in 2018, 18k white gold with a white gold tang buckle, manual wind Patek Philippe Caliber 28-20 REC 8J PS IRM C J module, 8 day power reserve, date and date indicator, blue dial with applied white gold indexes, white gold hands and, sapphire crystal, display back, size 37.4mm x 46.9mm, thickness 10.5mm, Like New with original box, setting pin and certificate dated April 2016. 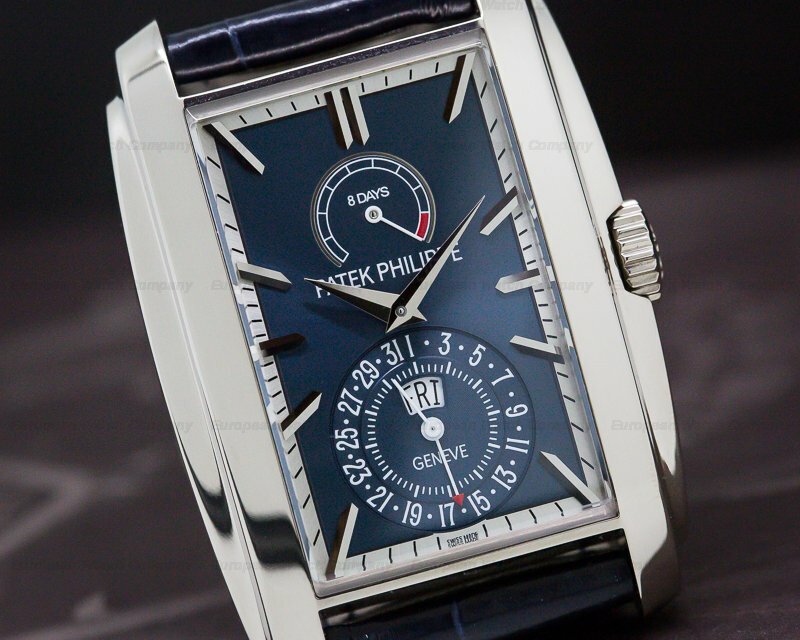 $59,5400 MSRP. 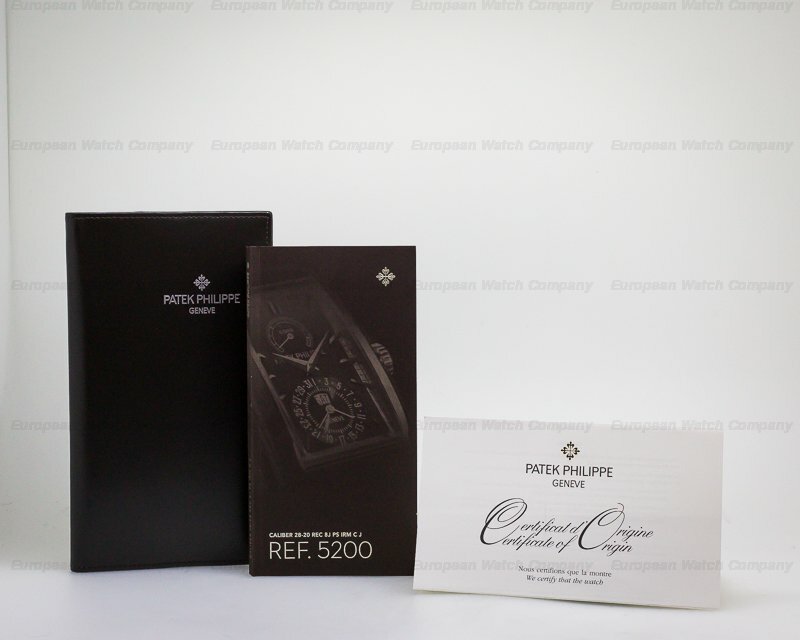 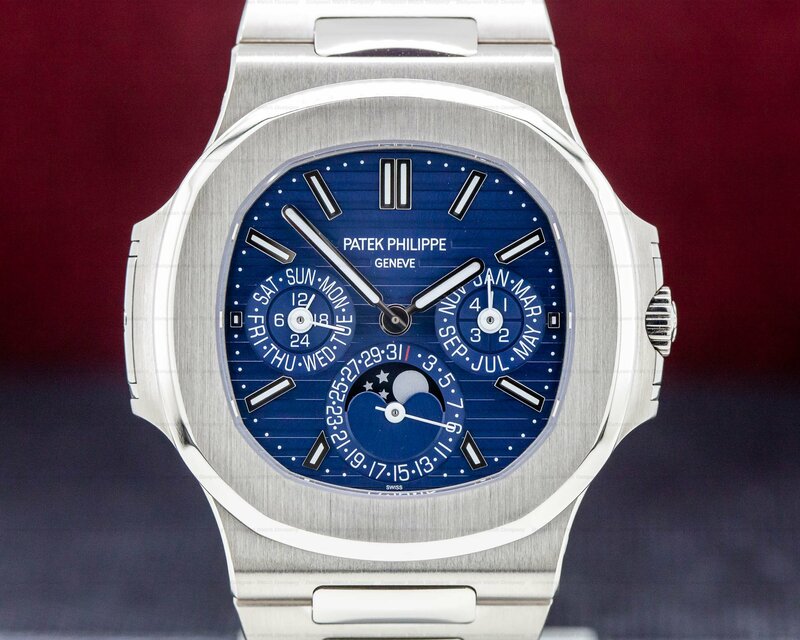 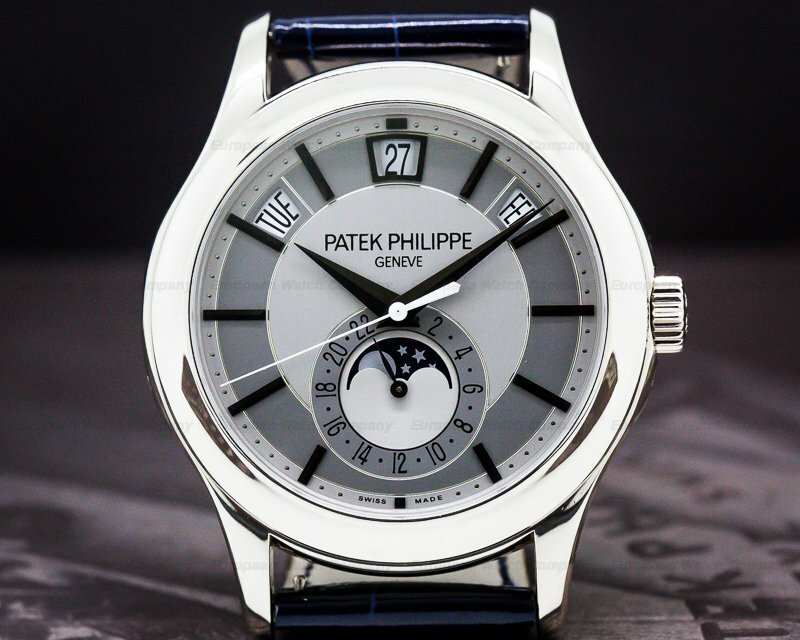 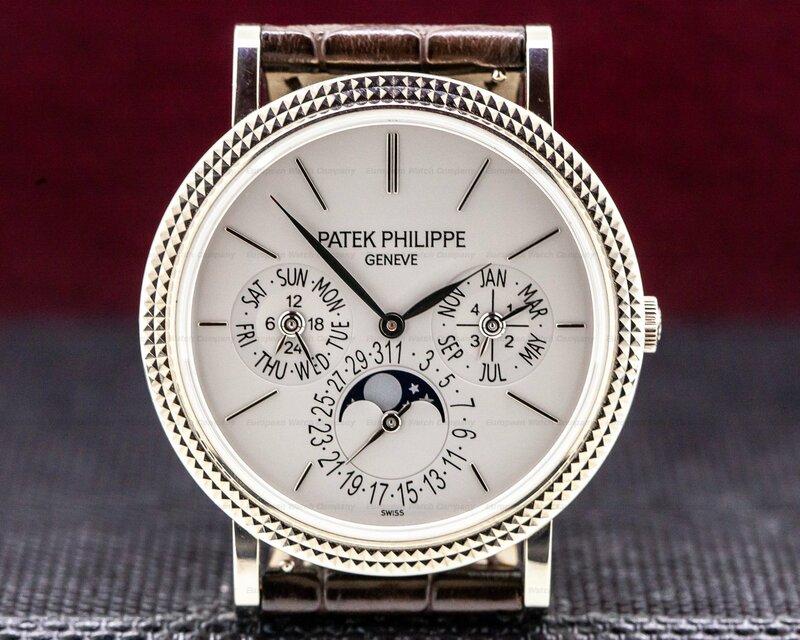 This an 18K white gold Patek Philippe 5200 Gondolo 8 Day, 5200G-001. 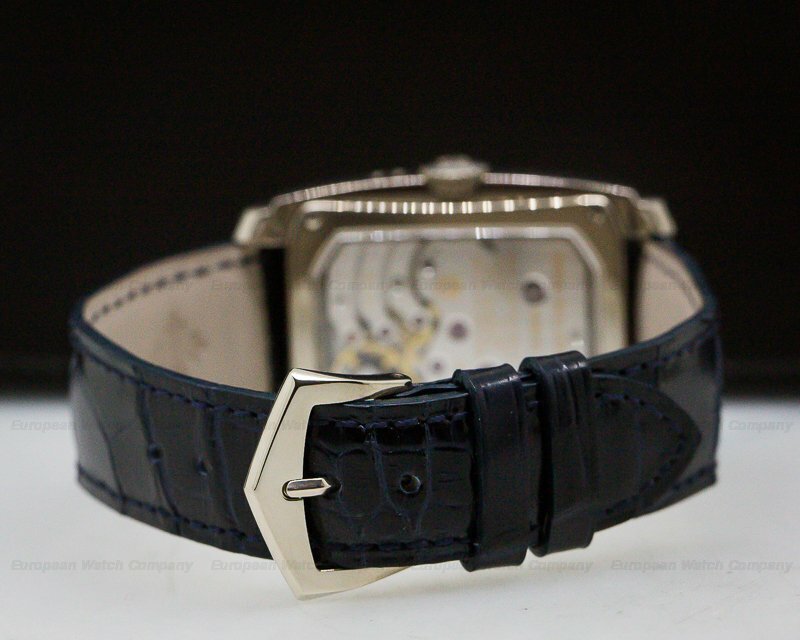 It has an alligator strap with an 18K white gold tang buckle, a scratch resistant sapphire crystal, and an exhibition sapphire display crystal case back. 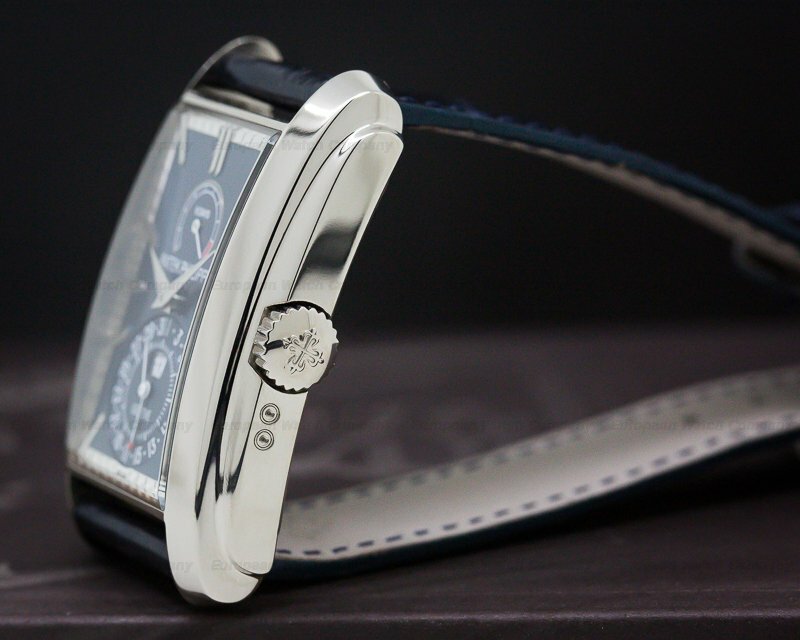 The winding crown is protected by the case design. 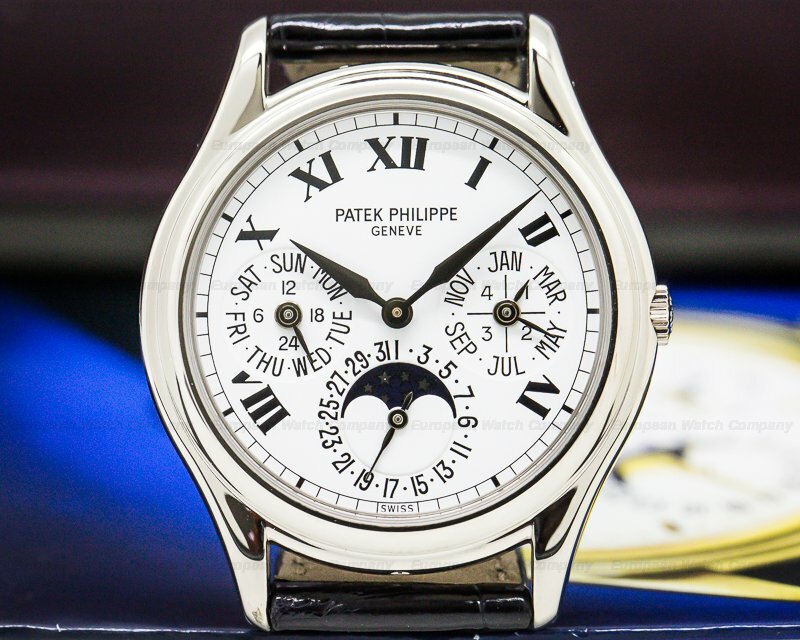 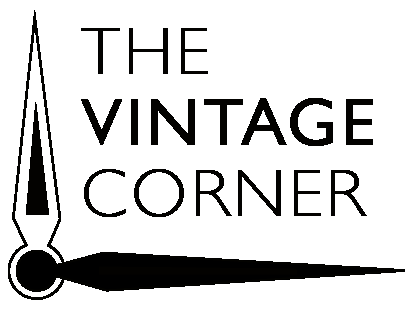 The curved 37.4mm by 46.9mm solid case, flat arched bezel, and integral lugs are polished. 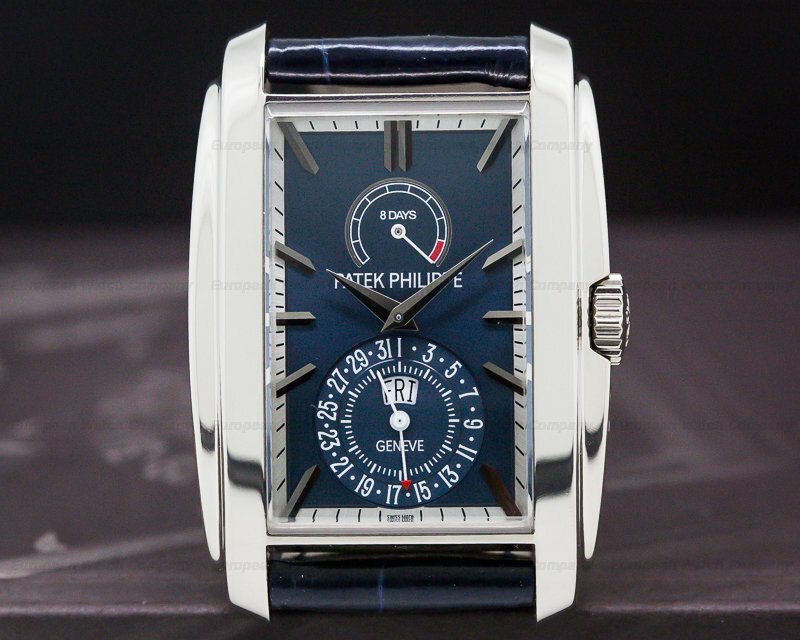 The shiny blue dial has applied faceted white gold baton hour index markers, white gold hands and an outside minute track. 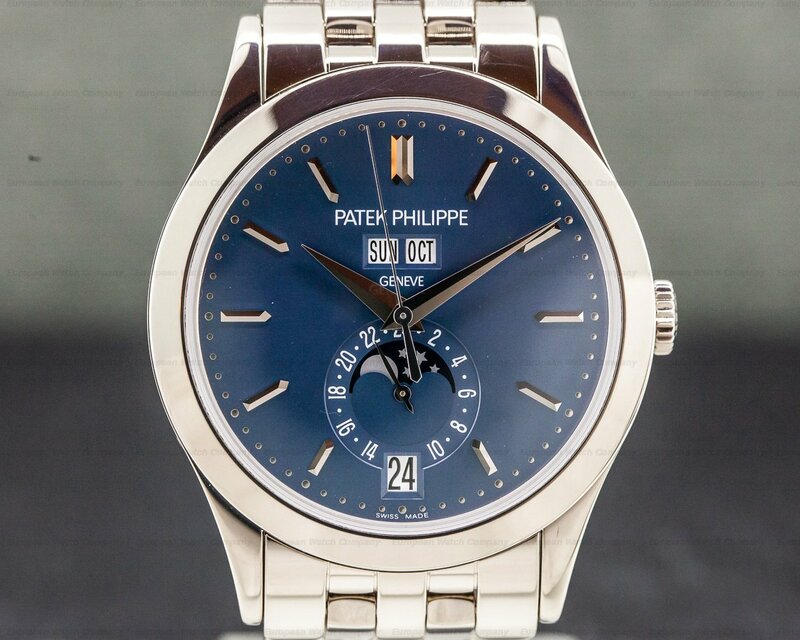 There is a subsidiary 8-day (192-hour) power reserve indicator at the 12 o'clock position, and a combined small seconds sub dial with the day and encircling date at 6 o'clock. 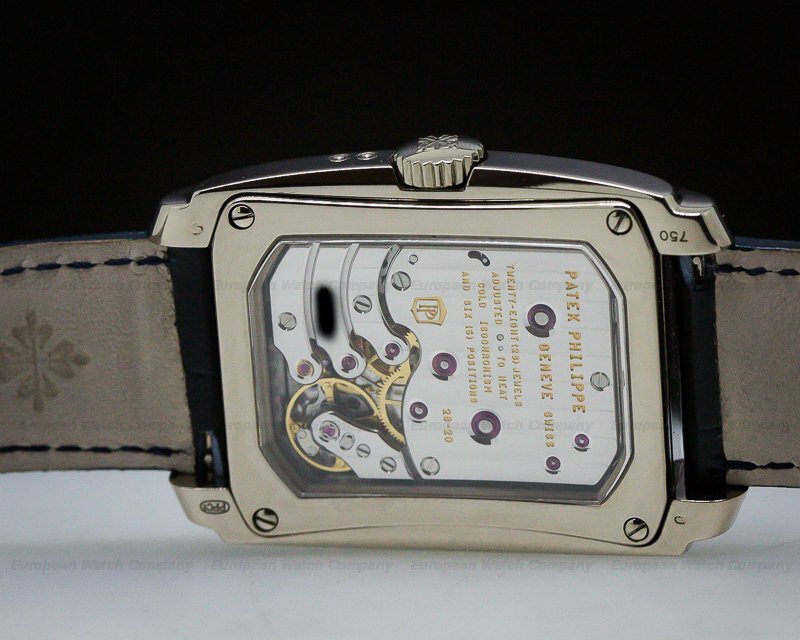 It's water resistant to 30 meters/100 feet, and the 10.5mm thick case, dial, and movement are all signed. 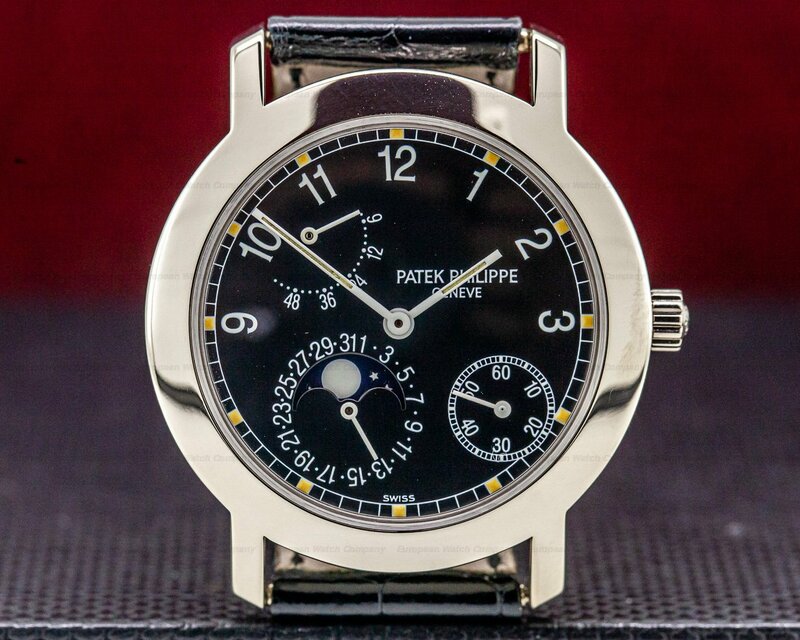 The mechanical manual winding Patek Philippe Caliber 28-20 REC 8J PS IRM C J module movement is rhodium plated, with fausses cotes embellishment, and it's hallmarked with the Patek Philippe seal. 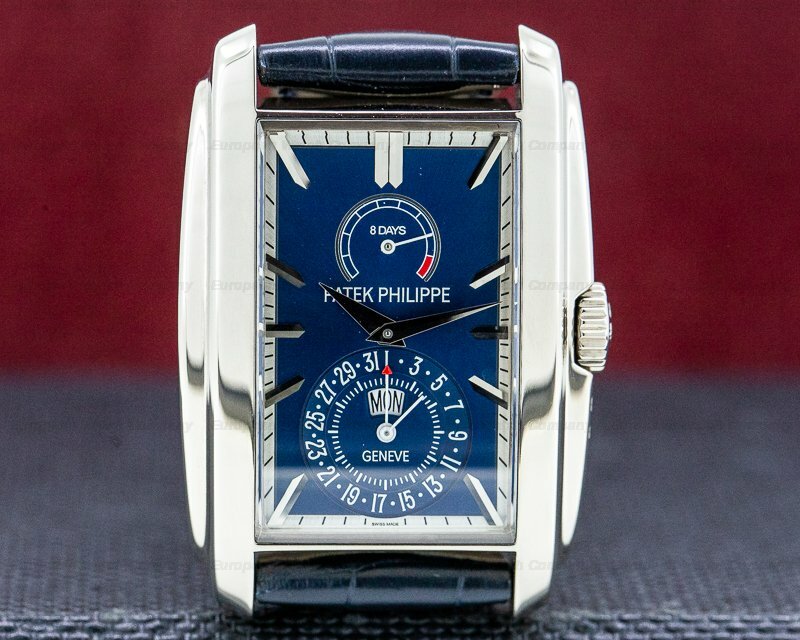 It's constructed with 28 jewels and 235 components. 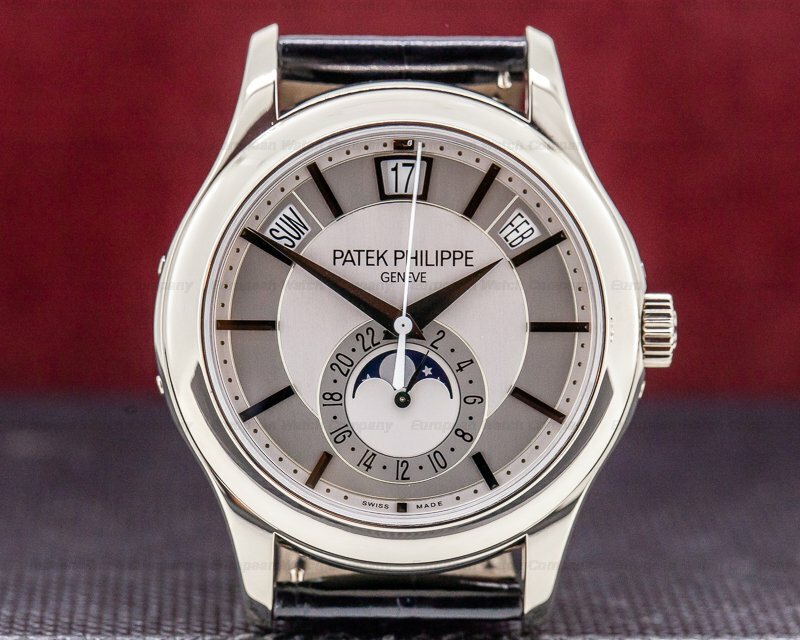 It includes a shock absorber mechanism, a straight-line lever escapement, and a Gyromax balance that's adjusted for temperature, isochronism, and five positions. 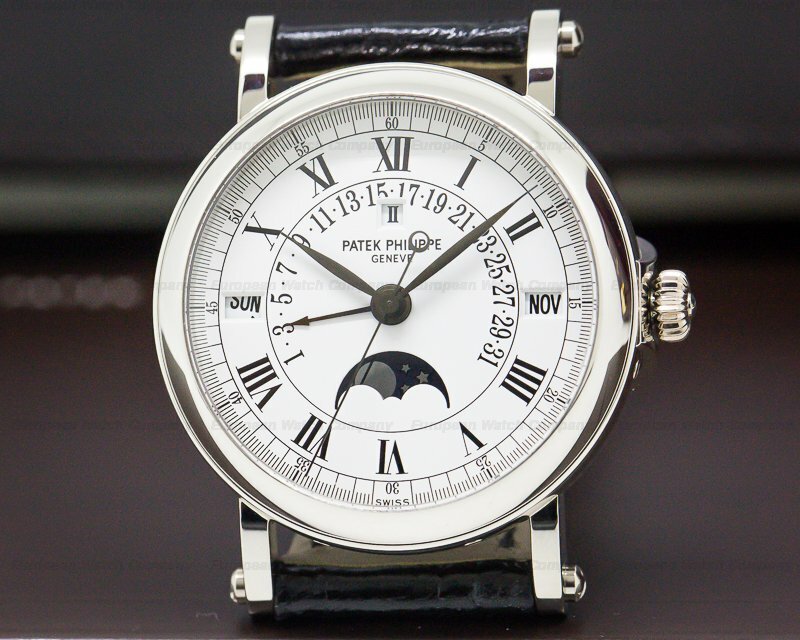 It has a Spiromax balance spring, and the mechanism oscillates at a frequency of 28,800 vph (4 Hz).